– Gravity is a force, but it’s not a force of attraction, it’s a force of pressure. – There is a gravitational flux in motion (it could be named “aether” in motion, “galactic dust” in motion, moving “Higgs field”… science has a big problem calling to same reality with very different names) that pressures on the matter that it finds in its way, trying to pass through it. Depending on the resistance of that matter to be passed through, because of their spatial density, the gravitational flux will create a gravitational field with a specific curvature. – Gravitational curvatures vary periodically. Gravitational fields expand and contract periodically. When the gravitational field’s pressure on matter is higher because of the higher material resistance, the gravitational curvature will experience a higher refraction or amplitude. The concave gravitational field acts like a longitudinal wave. – The higher or lower friction of the gravitational flux on matter will determine the periodical gravitational variation and its frequency. When the pressure of the gravitational field is higher the friction on matter will became higher and it will determine a variation on the material spatial distribution, changing its density that will became lowest. It will produce that the gravitational flux passes through matter more easily, experiencing a variation on its curvature. Now the gravitational curvature will have lower refraction because of its lower pressure on matter. It is a periodical process. – When two gravitational fields that vary periodically entangle, they create in their mutual intersection four new fields that are electromagnetic. – By “entanglement” I mean the physical intersection between the two fields that vary periodically, creating shared fields with internal orbital motions and external spatial displacements and with periodical and different pressures on them. – The distinction between what electromagnetic is and what gravitational is depends on the reference point. It’s totally artificial. – The entanglement of fields that vary periodically is applicable at macro and microcosmic level. There are neither two different kind of natures nor different laws at different levels. – The phases of variation of the entangled gravitational fields determine different motions, pressures, directions and energies on the system. And they all are periodical. 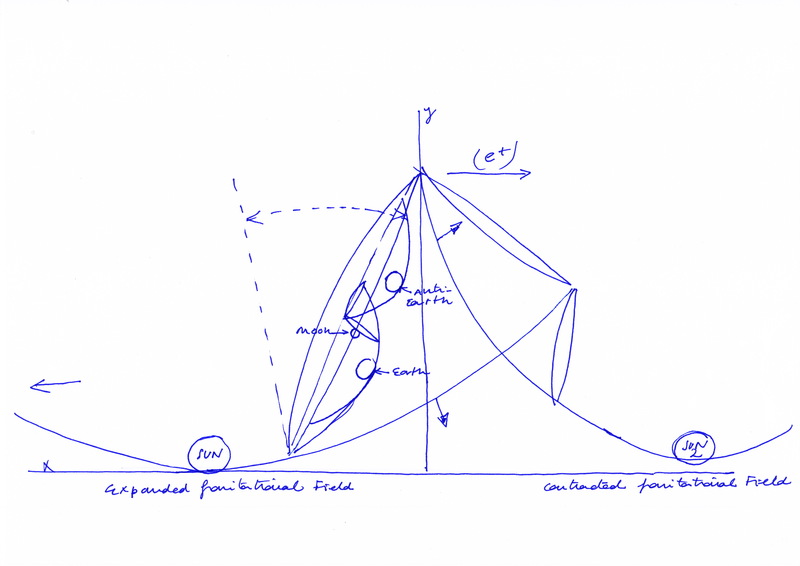 – When the entangled gravitational fields vary with opposite phase, when one of them expands the other one contracts and vice versa, there is an asymmetry at the horizontal plane, towards the side of the gravitational field that is contracted. At atomic level this situation it’s currently known as “fermions” ruled by the Pauli’s Exclusion principle. 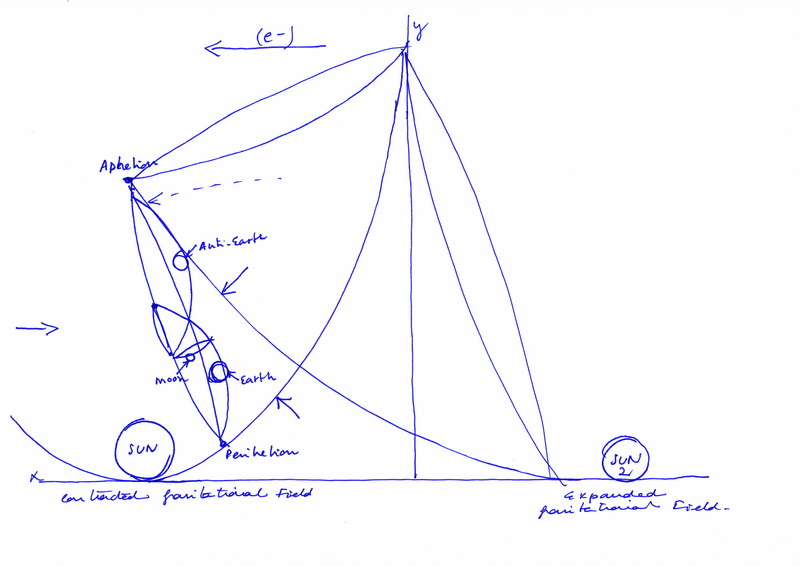 – When the entangled gravitational fields vary with equal phase, they both contract at the same time and later they both expand and so on, there is an asymmetry at the vertical plane, towards the concave side side of the entangled gravitational fields when thy both are contracted, and toward the convex side of the entangled gravitational fields when they are expanded. At atomic level this situation it’s currently known as “bosons” do not ruled by the Pauli’s Exclusion. – Mirror reflected dark matter violates the Pauli’s Exclusion principle in fermions; the Pauli’s Exclusion principle rules mirror reflected dark matter when it comes to bosons and its anti-gravitational force; the Pauli’s exclusion principle explains the decay of the photonic energy when it comes to bosons. You can read about it on other posts on this blog. – The four fields created by the gravitational entanglement are the currently known subatomic particles. – Electrical charges are fields that move periodically in the space-time. Electromagnetism is not a property of matter, it’s a consequence of spatial displacements. – Electromagnetism only appears with two entangled gravitational fields that vary periodically and it expresses its effects in a different way depending on the equal (subatomic particles are fermions) or opposite (subatomic particles are bosons) phases of variation. – When a matter has more “electronegativity” than other, it means that its gravitational field is contracted and the entangled gravitational field of the other matter is expanded. In this case the shared electromagnetic field that is the subatomic particle known as electron or as positron, moves toward the side of the contracted field. You can see easily in the picture that I have put below. – So, when it comes to fermions, the “electron” field (and its mirror reflected dark field at the convex side of the entanglement, with an inverted curvature) is displaced by the mechanism toward the left side, side of the field that is now contracted. Later it will move toward the right side, the side of the gravitational field that now is contracted, and it will be named a “positron” (It’s mirror reflected field will be a dark mirror reflected positron). – When the phases of gravitational variation are equal, the subatomic particles are bosons, at the horizontal plane the shared subatomic fields have are symmetrical. Here the electron field does not move toward the right and left sides. But it moves up and down at the vertical plane. 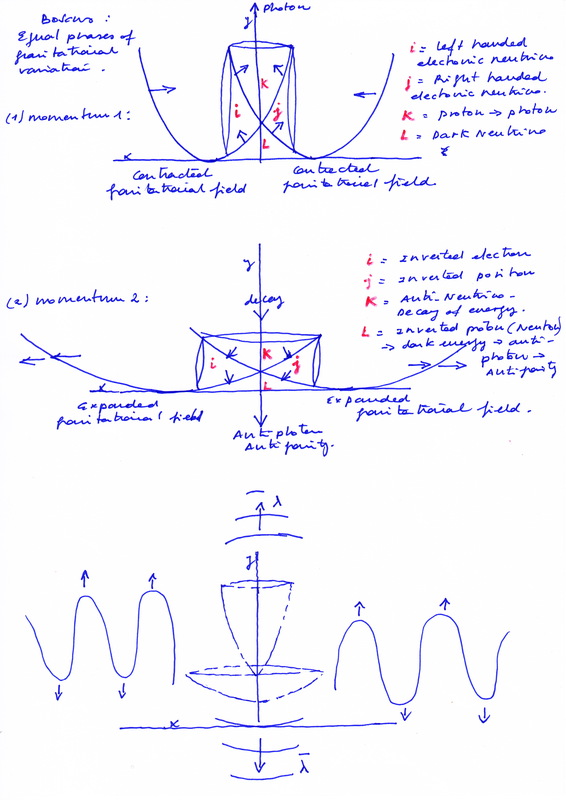 The Pauli exclusion principle does not apply at the left and right side that have identical mirror symmetry, but it rules the up field at the concave side and its mirror reflected down field at the convex side of the entanglement. – It is not necessary an inflation theory to explain the horizontal symmetry of an entangled system (or universe) that vary periodically in this way. But in the model that I’m explaining all horizontal symmetry hides a vertical asymmetry and vice versa. – The “Big bang” and the “Big crash” (or the “Big silence” as some theories are speaking about) are only to moments of the periodical variation of the entangled gravitational fields that vary with equal phase. The Big Bang is the photon of two entangled fields-universes. In a 6 dimensional model, where would be placed our universe? And In a 30 dimensional model with a central periodically variable field-universe with 4 others periodically variable fields-universes entangled, where it would be placed? – The phases of variation synchronize and desynchronize periodically too. – Between each gravitational expansion and contraction it occurs a delay. In this way, the phases of gravitational variation result inverted periodically. This process appears similar to the periodical inversion of the oceanic tides. It would explain the progressive precession of perihelia’s and the periodic and physical inversion of magnetic poles and retrograde movements. – The current solar system model is totally unacceptable. It cannot explain all the observed asymmetries and periodical fluctuations in a mechanical way and with a unique mechanism. – The dynamical mechanism that I’m presenting in this general and inaccurate way would have to explain all the symmetries and asymmetries of our solar system. – Planets are not moved by the inertial movement of a remote and primitive Big bang that has been preserved until now. Celestial bodies are moved by the periodical variation of the entangled fields that create the fields that they orbit. In a 6 dimensional solar system model which field would orbit our Earth? – The pictures that I have put below would be applicable at any universe, any stellar system or any entangled atom or molecule. I have drawn different pictures with two entangled fields that creates the 4 news fields, and their equal or opposite phases of variation. – With more than two entangled gravitational fields that vary with the same phase, the molecule could be a tachyon and its resultant waves could be faster than light. Each nuclear fluctuation creates different types of waves, depending on their phases of variation. They create waves of light and they create too longitudinal quantum waves like sound waves. – As you can see on the pictures above, the four fields created by the entanglement of two gravitational fields, constitute the shared “atomic nucleus” with the “subatomic particles”. – Atoms do not have inside a nucleus with neutral and positive charges nor negative charges outside it. This is a wrong model that is highly limiting and has determined and is determining all the development of atomic physics, chemistry and biochemistry. – Quarks are the pushing forces produced by the variation of those gravitational fields. They could be represented as vectors of force. In this sense electrons are formed by quarks too. – Subatomic particles can be explained through four imaginary numbers. The “Imaginary” axes represent mirror reflected geometries. What axis is “real” and what “imaginary depends on the perspective of the observer. Each “real” axis has two imaginary axes, one above and another below it, with a mirror-inverted symmetry. But each imaginary (or mirror inverted axis) is at the same time the real axis of two others mirror reflected axes. I’m speaking about axes in a Cartesian representation but I consider that all reality is constituted in this form by superposed layers with mirror-inverted symmetries. prime material the simple common air. Maybe this is how all living cells acts. – Any matter can be transformed into another changing its spatial distributions and so the frequencies and phases of the gravitational entanglements at molecular level. – The Periodic Table of the Elements is a totally artificial division of the same elemental matter. The atomic number is not the number of protons, it’s only a sequential number. All the equations that explain the spectral lines of matter are ridiculously artificial mathematics. – The Hydrogen and Helium of the periodical table refer to the different moments of the same periodically variable field, its lowest pressure, its lowest refraction, its lowest amplitude in the case of the Hydrogen “atom”; its highest pressure, its highest refraction, its highest amplitude in the case of Helium. – The material weight occurs because its different spatial density, it’s spatial distribution, that determine its resistance to the gravitational flux. Weight, like electromagnetism, is not a property that matter has per se. They all are consequences of spatial distributions and their interactions with the flux of pressure that animates matter. – Redox and acid base reactions are explicable in the same way because of the variations of the entangled gravitational fields. – Hydrogen bonds are not formed by “Hydrogen atoms”. It looks that current science is identifying here Hydrogen with the gravitational flux that creates the gravitational fields and their entanglements. Current science is using hydrogen on several different artificial ways; our scientists could not explain the gain or lose of protons in redox reactions without the participation of the protonic charges of external hydrogen, because they would need the intervention of atomic reactions that would require the spend of a lot of energy. – Water is not H2O. It is possible to obtain water changing the phases of variation of the entangled gravitational fields that form the oxygen molecule. Telecommunication engineers know very well the modulation of waves’ phases. You can read about it in other post on this blog. – Quantum coherence takes place when the entangled gravitational fields vary with the same phase. – I do not know what fire is. I suppose it’s related with the vibration of the gravitational flux itself. And I do not know why matter does not deteriorate at low temperatures. – I think temperature refers to the variation of the entangled fields too. In this sense heat has in itself the principle of cold, like gravity has in itself the principle of antigravity. From this perspective is not necessary to burn or destroy matter for getting energy. I think it’s not necessary to obtain any kind of energy. We only need to modulate the phases and frequencies of variation of the entangled fields. Nature has already provided to us with all what we need. – Heisenberg’s Uncertainty principle should be named Heisenberg’s “determinacy principle”. It shows that it’s possible to modify the dynamic of the system with a beam of light when we try to observe it. – It’s a big a very limiting mistake too to consider that gravity has an insignificant value at atomic level. – The Planck constant (or its reduced Dirac version) represents the pushing force of the gravitational flux on matter. It’s not constant because all in our universe, and all infinite universes vary periodically. It’s the same that Newton constant. The difference between the values of Newton and Planck constants could be explained because the filtration of that force of pressure. Our sun modulates and filtrates the pressure of the gravitational flux on us. And our gravitational field makes a filtration for us too. It could be interesting to measure the value of Plank constant by example on our Moon and compared it with its measure outside of the gravitational field of our Sun. – The difference between Dirac and Majorana antiparticles is that Majorana antiparticles are physically the same field that is located at different moments in opposite places having mirror symmetry. Dirac antiparticles are different fields, with the same characteristics, placed at the same or different moments at opposite places that have a mirror or mirror reflected geometry. In this sense, electron and positrons are Majorana fermionic antiparticles. Neutrons and protons are Dirac antiparticles when it comes to fermions. 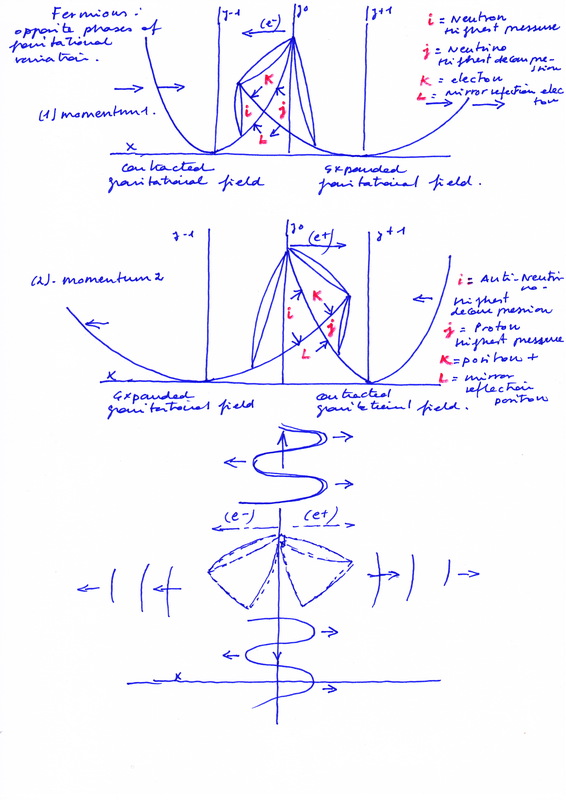 – Dirac negative energy is the consequence of the variation of the entangled fields. It occurs when one field expands and the other contracts, transforming a neutrino into an electron and a mirror reflected dark electron. The same could be said whit anti-neutrino, and a positron when the spatial displacements take placed toward the right side. – You can see the periodical transformation of the subatomic particles on the pictures above. – All asymmetries have a cause. Our universe, at atomic level too, is not ruled by randomness and it is not irrational. All periodical fluctuations have a cause and must be explained by the same unique mechanism at atomic and astrophysical level. The gravitational fields of celestial bodies must be entangled too. – The periodical movements of our moon must be explained because of the periodical variation of the space that orbits. It must exist a gravitational field from other planet entangled with the gravitational fields of our Earth. The existence of mirror matter was predicted by Greek people 25 centuries ago; they called “Antichthon” to this mirror counter-Earth. It would explain the periodical motions and the fluctuations of the orbital plane of our moon. – The gravitational field of our sun must be entangled with the gravitational field of at least other star. The solar system could be formed by a central star and four other stars with their gravitational fields entangled with the central field. Our Earth would not orbit around our sun, it would orbit around one of the fields created in the intersection of the entangled stellar gravitational fields of our sun and other sun. – The gravitational entanglements and the strength of their shared dynamism that create their union, depend on the distances of the matter that creates the gravitational curvatures. – The fields created in the gravitational intersection are the currently known like chemical bonds. A dipolar covalent bond takes place when the phases of periodical variation of the entangled fields are opposite. – The orbital motions that take place inside of the 4 electric fields created by the gravitational intersection are magnetic. – The strong and week interactions refer to the different forces of pressure creates by the gravitational variations and the strength of the shared internal field’s dynamism. By example, neutrons (and at other time protons) are fields formed by the contraction of a gravitational field and the expansion of the other entangled field, when they both vary with opposite phases. It receives the ascending pushing force of the field that contracts, and the descending pushing force of the field that expands. It receives a double pushing force on it cause the contraction of its own space. The velocity of the matter that orbit inside this contracted neutron-field would experience an acceleration? Without acceleration the process of to complete an orbital revolution inside this field will take less time because the space will be smaller. – In the case of the neutrino it occurs the contrary. The Neutrino field experiences the double decompression created by the ascending field that expands and the descending field that contracts. – In the case of the electron it receives the pushing force of the field that contracts. Later this force apparently decays creating the pushing descendent force that is the upper down quark of the neutron (or proton). But it’s not properly a decay of energy; it’s the pressing force of the descending gravitational field that expands. – Photons are the longitudinal waves created by an ascending pushing force, when the two entangled gravitational fields vary with the same frequency and they both contract. Later, when they both expand, this ascending force is lost occurring a decay of energy that has it counterpart at the convex side of the gravitational entanglement. – The force created at the convex side of the entangled gravitational fields when they both expand at the same time is anti-gravitational because it follows an opposite direction with respect to the gravitational flux. – When it comes to bosons, the two entangled gravitational fields vary with the same phase, the photonic ascending force that occurs when they both contract is a strong interaction. The processes that took place inside of this field, for example an orbital motion will need less time because of the smaller space that it contains. The decay of energy that will occur when they both expand will represent a weak interaction that has its counterpart of a dark anti-gravitational strong interaction at the convex side of the entanglement. – The concepts of dark matter and dark energy depend on the position that we are observing. If we are placed in the convex side of the gravitational entanglement, for us all what occur at the convex side is dark because we cannot perceive it. If we are placed in the concave side of the entangled gravitational fields, but inside of the field “neutron”, we won’t watch what occur inside of the field “electron”. The curvatures of the fields, likely here is applicable the concept of gravitational lens, will deviate for us their created waves. – Dark holes are one of the fields created on the intersection of two entangled gravitational fields when they vary with the same phase and contract at the same time cresting the photonic wave. – The necessity of a statistical approach to atomic matter is only a pernicious consequence of the wrong and very limiting atomic model that physicists have assumed. – Matter and energy are and are not interchangeable, it depends on the accuracy of we are speaking with. If we consider a pressured field as material mass as in the case of a neutron, then we could say that the kinetic energy of a previous proton (at the right side) has transformed the mass of a previous anti-neutrino (at the left side) into a neutron (at the left side). And later we could say that the energy of that neutron has transformed the mass of the previous neutrino into a neutron. In the middle way, electrons or positrons intermediate between those transformations. But really what transforms energy and masses are the periodical variation of the entangled gravitational fields. – With respect to the quantum confinement and freedom, it could be said that when it comes to fermions and one of the entangled gravitational fields contracts, the pushing forces that moves toward the side of the contracting will meet an opposite pushing force coming from the another extreme of the contacting gravitational field. We will have inside of the contracted gravitational field to opposite pushing forces, left to right and right to left, as the case of Casimir forces. When it comes to bosons and the two entangled fields expand, the descending forces of the expanding fields do not meet that opposition because the another extreme of the expanding gravitational field will have the same direction toward the left or the right side in each case. – Van der Waals forces are explicable too through the periodical variation of the entangled gravitational fields and their opposite or equal phases. It tried to do it on other post. – Gravitational waves are represented at the pictures above too, but you can see them more clearly on other pictures that I put in other post related with the atomic spectral lines, on this blog. All pictures on this blog represent the same mechanism, and they could be considered as molecules, entangled stellar systems, or entangled universes. – The aim of this theoretical research, that I have made trough four years until now with the help of many friends, has been to comprehend the mechanism of cell’s division and differentiation and all its anomalies. I have commented in other posts how I consider anomalous gene mutation could take place and its relation with the issue of nuclear fission and weight transformation because of the spatial variations. – I have mentioned too the possibility that replication forks are the electromagnetic fields created by the intersection of the entangled gravitational fields that I have commented above. The concave side of that entanglement will represent the DNA templates, and its convex side the RNA template. – The acceleration and deceleration of the cell division’s processes and anomalous gene copies for example in Down syndrome are related with the alteration of the “normal” rhythms of the periodical variation of the mentioned mechanism. I guess that acceleration takes place not because of the acceleration of the velocity but by the decrease of the space which that process takes place in. – I think that bacterial and virus infections represent an alteration of the normal rhythms of variation, you could say pulsation, of the fields that constitute the specific molecules, cells or tissues affected. Any bacterial or virus infection should be able to be cured through waves modulation or spatial redistributions. I think the same about all kind of cellular diseases or gene copies anomalies. – Finally, I have put below some pictures with the model of solar system that I put on other posts. I dedicate this research with all my affection to all people that are suffering or have suffered because of any kind of disease, very particularly to those affected by cell diseases, and their wonderful families.